The Great Dividing Range, the Great Barrier Reef, the great expanse of the Outback. Experience the diversity of Australia at three unique and spectacular locations. 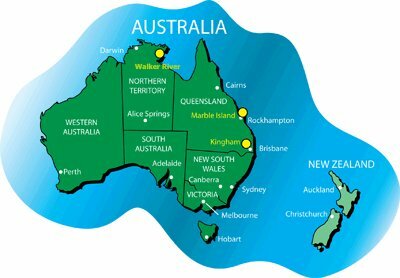 Australia is a big country (comparable to the contiguous 48 states of the USA, or 3 times the combined size of the UK, Germany, France, Spain and Italy). Our three exclusive locations provide a great cross-section of the Continent. Kingham is close to Australia’s famous beach resorts and is home to iconic natives like the kangaroo and koala. Our islands concession is a slice of sub-tropical paradise amongst the coral atolls of the Great Barrier Reef. The Northern Territory is wilderness outback, remote and unspoiled, and packed full of crocs, buffalo and barramundi.